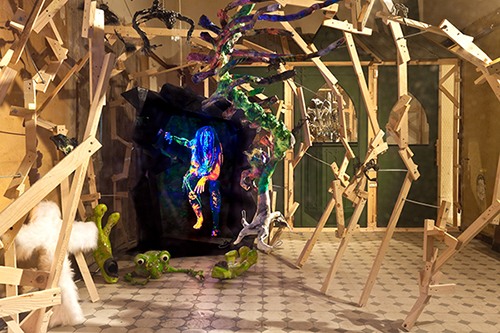 With their walk-in installations, painted sculptures, photoworks and performances GODsDOGs create a sense of overload. The duo collage phantastic myths with cyberpunk imagery, filmstills with lived through experience, wooden constructions with filigree drawings. It´s like time, colour and form were interfolded and condensed, to form gates into parallel worlds. Each spacious installation contains works from different genres, which are affiliated with the installation, but carry the magic of the whole with them even when displayed in a different context.